Cook linguine in a large pot with salted water until al dente. Strain and set aside. Meanwhile on a medium heat, place oil in a fry pan and heat for one minute. Remove lobster and prawn meat from the shell and cut into bite sized pieces. Add one clove of garlic, prawns and lobster to the pan and sauté for 5 minutes. Remove seafood to a bowl and keep covered. Finely chop remaining garlic and chilli and place in the heated pan with 2 x tsp of olive oil and stir for one minute. Add in diced tomatoes and parsley, sauté for five minutes or until tomatoes are soft. Add lemon juice and a pinch of salt and pepper to season. 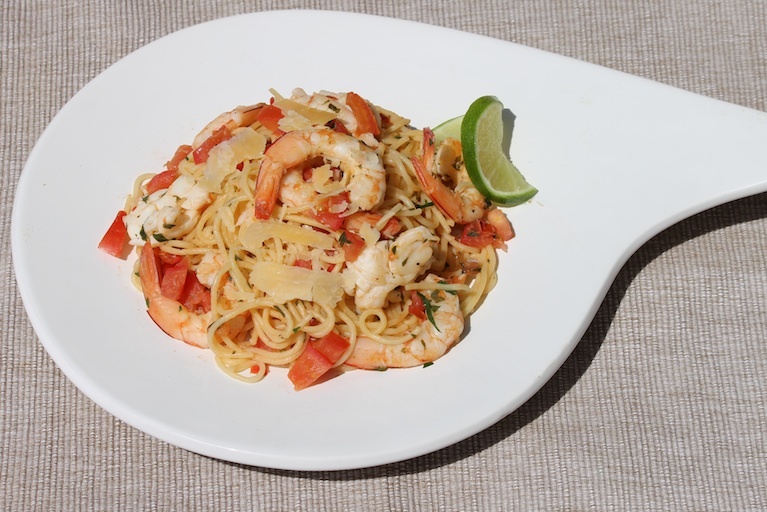 Return lobster & prawn meat back to the pan, combine and cook for two minutes or until seafood is cooked through. Place cooked pasta in a large serving bowl and pour over seafood. Toss to mix and serve with parmesan cheese and lemon wedges.